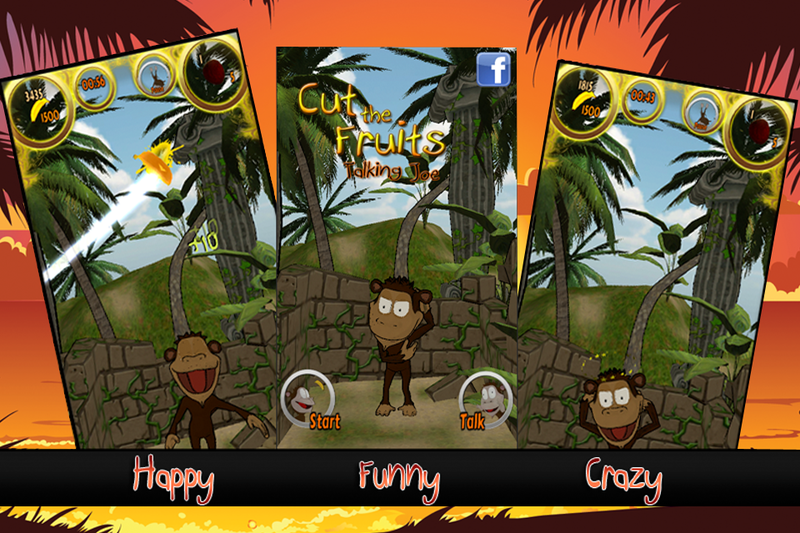 One of the best downloadable apps with a delightful little monkey and a terrific game where all of your reflexes will be needed to swipe with your finger across the screen and slice all the bananas into pieces. 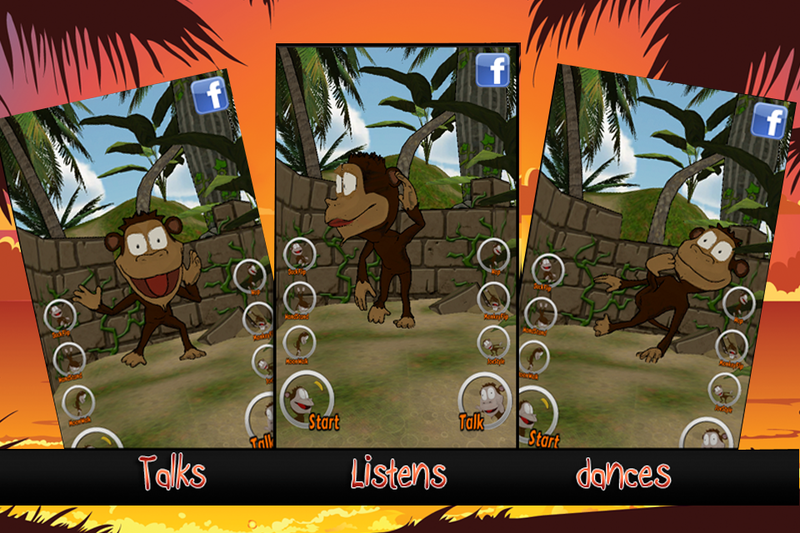 Joe is a very cool tiny little monkey with a crazy personality and a monstrous hunger. Joe lives in the jungle between the ruins of an ancient temple and cannot wait to meet you. 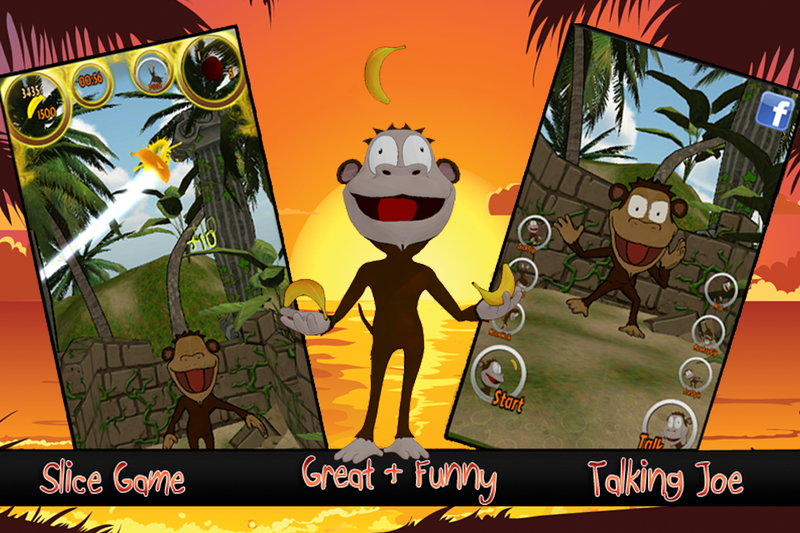 Spend some time with this entertaining monkey and get to know him better. You will see that he is a very happy guy and that he likes to do a lot of different acrobatic things like a backflip, a handstand, he jumps on one leg, shows you how he can dance by performing the moon walk and much more. Even if Joe likes to play and do mad things his favorite activity is eating. He is always hungry; therefore, always ready for a hearty meal. Unlike most of his fellows he does not climb on a tree to get his food. As he lives in a mystic place he just needs to go to some sort of magic (invisible) waterfall. The special thing about the waterfall is that instead of water falling down there are bananas coming from every direction. Somebody could think that he is a really lucky guy, if it would not be for the fact that in order to fill his stomach he needs to slice them first. Your task is to try and chop the bananas in as many pieces as possible. The more times you manage to slash through them the more Joe’s stomach is going to be filled. Use your Ninja reflexes to reach your target in the shortest time possible and remember to stay alert because there are not just bananas falling down! In fact there are also some nasty coconuts that are falling down once in a while. The problem is that there is no blade capable of cutting through their iron skin and if too many coconuts will hit Joe’s head, he could be badly hurt or even encounter death. The only way to stop these super nuts will be to try and divert them from their original path by striking them before they land on Joe’s poor head. ✔Slicing Game with more than 20 levels to play: Super entertaining action game. 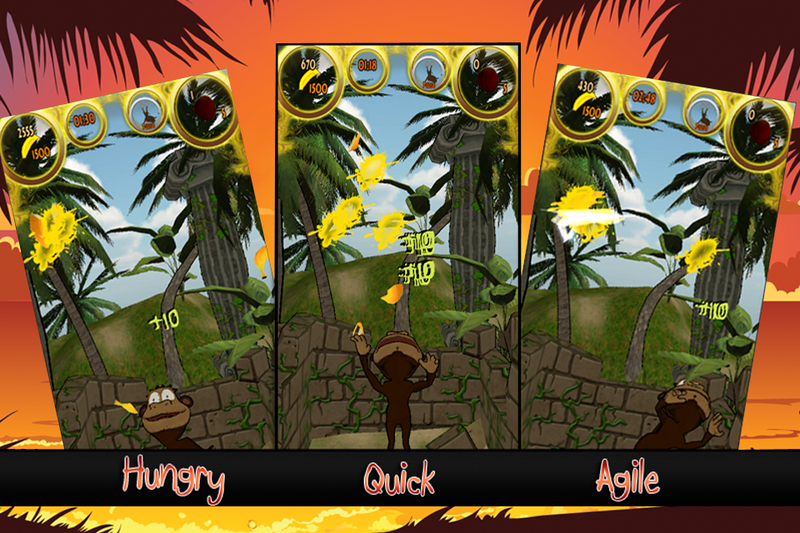 Use your finger like a saber and swipe up across the screen to chop the bananas into pieces like a true sword master. Download this fantastic app! You will get 2 applications in one. An amazingly interactive figure that will repeat what you say with his funny voice and entertain you with his activities. Moreover you will be able to kill some time with a smashing and super addicting game. Warning: Pay attention to not burn your finger by trying to establish a new record. If you move your finger on the screen over a certain speed for too long without any break, it could start burning slightly because of the friction between your finger and the screen.